How do writers of P.I. stories confront the Olympian presences of Raymond Chandler and Dashiell Hammett, and when did they start doing it? "When he could see her more plainly, Thursday wondered why he had expected her to be young. She was anything but that— a small frail woman, delicately wrinkled, with hair the moonlight couldn’t whiten." 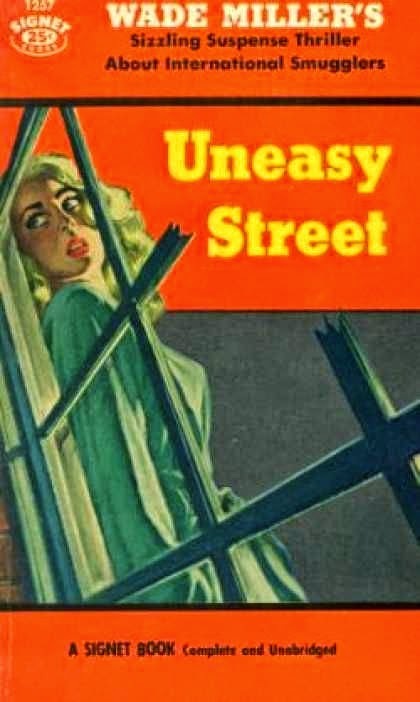 Uneasy Street has something of Chandler's yearning romanticism with a tinge of Hammett's witty detachment, the latter possibly because Miller wrote the book in the third person. It's witty without cracking wise, serious without getting maudlin, the way some of Chandler's successors in the 1960s did. It's in the tradition of both great progenitors of hard-boiled crime without being greatly reminiscent of each. And it's a good place to look if you wonder where private-eye fiction went after Hammett and Chandler. I've added Wade Miller's novel to my BOLO list. Perhaps you will be posting more about other Hammett-Chandler offspring. I'm looking forward to more discoveries. And isn't it great that e-text formats (Kindle et al) are resurrecting so many "lost" authors and books? I hope Wade Miller is among them. I am on my way to Amazon to find out. Robert: Lots of Wade Miller is available as e-books from Prologue, but also from some of the publishers of hard-boiled crime writing, including Hard Case Crime and Stark House Press. I don't know if I'll write about other Chandler-Hammett offspring. Almost all PI novels are recognizably a bit of one, the other, or both. ( You might be interested in this old post.) This book was of special interest because it seems to represent a critical point, when PI writers could assimilate the C-H tradition while maintaining a distinctive voice and without subsiding into homage or decadence or going off in some new direction. Peter, I have not read Wade Miller but it was interesting to read your comparison of Miller's novel with Chandler and Hammett, two authors I haven't exactly done justice to either. The Library of America published two volumes each of Hammett and Chandler, one of novels, and the other of short stories and miscellaneous pieces. The Everyman Library volume of Chandler's short stories is complete, or just about.